If you're reading this article today, chances are that you are a fan of miniature wargaming. Our hobby enthusiasm isn't always as infectious as we would like it to be, and there are always friends that we want to get into the games we love and play but convincing them can take time. Lets be honest, the hobby can be quite expensive and can take a lot up a lot of time, which can be a bit off-putting for those on the edge of making the plunge. The easiest, or at least less difficult, group of friends to try and convert are those that already love board games. Now while you can run demos for them, it's not quite the same as playing a full game. This is the perfect place to introduce them to what I like to call Gateway Games. These games are ones that occupy the space between pure boardgames and full table wars. They have elements of a board game, relatively easy to grasp rules, likely a board or tiles to set up and of course dice or something else to determine outcomes of actions. Where these start to creep into the miniature wargames though is that the pieces you use tend to require either assembly, painting or both. They are detailed just like a model kit you would buy for a regular wargame, and oftentimes the rules that accompany the games act as a sort of primer for the mechanics of various game systems. These games are perfect introduction courses to try and get your friends hooked, and I've been using them for years to push my friends over that edge into my favorite hobby so I don't have to sit there all alone. I figured I would share some of my favorite tools to infect my friends with the mini-wargaming bug. 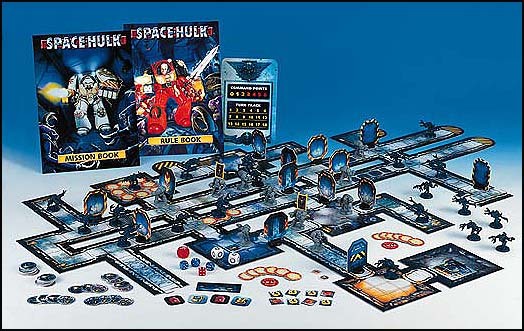 Space Hulk is a specialty game produced by Games Workshop that is set in the universe of Warhammer 40K. It pits Adeptus Astartes Terminators against the onslaught of Tyranid Genestealers in the confines of a derelict space ship, called a Space Hulk. For those of you not familiar with the 40K universe, Adeptus Astartes are genetically engineered super soldiers while Tyranids and Genestealers are xenos akin to the aliens from the Alien series of movies. The basic concepts of the two factions should be fairly easy for any sci-fi fan to recognize. The game board is a series of tiles that can be configured in whatever form the mission or scenario calls for. There are 16 missions that come packaged in the current release of the game, but the rules also encourage players to design and play their own missions or games. It is primarily a two player game, but you can play with more people if you're enterprising enough. The goal of the Terminators is to complete the mission objective before they are overrun and killed by the xenos scum, while the Genestealers job is to kill and eat some delicious meta human meat. The game follows the basic concepts from the the 40K universe, introducing players to ranged and melee combat as well as a handful of incredibly useful specialty rules from the main game. Games can take anywhere from minutes to several hours depending on the mission type and on luck, but it is a lot of fun. 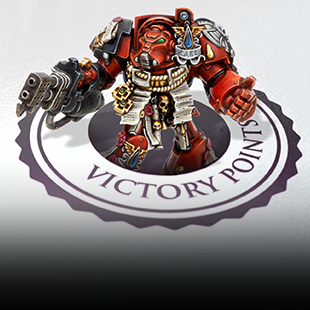 The base game comes with 35 highly detailed plastic miniatures that require assembly and painting, and offer a great opportunity to introduce someone to the craft side of the hobby on a much smaller scale. The miniatures can only be assembled in specific poses, so they don't have the configuration options that regular miniature kits for the 40K game have, which honestly isn't a bad thing. It' reduces the assembly learning curve by a considerable amount, but the end results looks so awesome that first timers will still feel pretty good about their handiwork. There are 11 Terminators and 1 Terminator Librarian, 22 Genestealers and 1 Brood Lord. Additionally, there are three plastic objective markers which are equally detailed. One of the other selling points of the board game, is that if your friends do decide to take the next step into the hobby, they models can be used in 40K as well. In the early stages of the game's life, it was widely available and was quite popular. Late in the '90s, Game Workshop cancelled their specialty line of games from production, and have only done limited releases and updates of some of the games over the last decade. Space Hulk is one of those games that has such a high demand that they will periodically re-release it, though always in a limited quality. We are currently at the tail end of a limited run of the game, and you can purchase it for $125 USD directly from any of your local or online retailers retailers, though I haven't seen it go for less than that. The game is no longer available directly from Games Workshop at this time though. If you're a fan of the 40K universe, this is a great game to add to your library, and one I use regularly to rope my sci-fi friends into taking a deeper look into one of the games I love playing.